Throw away the workbooks! Pack away the textbooks! Teaching a foreign language to a young child requires you to think differently about what learning looks like! The most effective method of acquiring a foreign language is the same method as a child acquires their mother-tongue; through regular exposure to the language in their daily lives. Charlotte Mason said that young children learn languages through, “the ear, and not the eye,” (Vol 1. p.301), and so when we begin teaching young children, initially it is the ear that needs to be trained as the child becomes accustomed to the sound of that new language. Before we jump into workbooks and expensive curricula, teach your child to speak the language at home through play and by natural exposure to the language. This blog post has been written in collaboration with WordUnited, who gifted my family their write-and-wipe flashcards and compensated me for my time. Our Muslim Homeschool uses affiliate links in blog posts and the sidebar. Please see Disclaimer for more information. How do we teach young children a foreign language? Young children can learn a new language by hearing it used in their day-to-day lives, without the need to use extensive curricula. “The child should never see French words in print until he has learned to say them with as much ease and readiness as if they were English.” Charlotte Mason (Vol. 1, p.301). Ideally, this requires at least one of the parents at home to know this language to a basic level, or for them to employ someone else who does. However there are no end to private language tutors or classes available in most cities, as well as online. “French should be acquired as English is, not as a grammar, but as a LIVING SPEECH. To train the ear to distinguish and the lips to produce the French vocables is a valuable part of the education of the senses, and one which can hardly be undertaken too soon.” Charlotte Mason (Vol.1 p.301). Once your children are familiar with the words, and how to use them in their speech, you can introduce them to the written appearance of those words. Before beginning them on workbooks, I would recommend using flashcards. Flashcards are an ideal way to introduce children to the written form of any langauge, and can be used in games and activities to help keep children engaged. At what age should I start teaching a new language? To put it simply, children should be exposed to the foreign language as early as possible. We all know from our own children, that at the age of two years-old, toddlers may have grasped only a handful of words. However by the time they become three, they are able to hold a conversation and articulate their needs and interests with relative ease. During these 12 months, there has been no “formal” teaching. Rather the child has heard the language spoke frequently used in the context of real-life, and that is all he/she needed to learn to speak it. Thee ages 2 and 3 years-old are critical in language development, and thus this is the ideal time to begin introducing a new language to them. However, whatever age your children may be, I would recommend you begin talking to them in a foreign language as soon as finish reading this blog-post! What is the best foreign language to teach a child? This is of course a matter of opinion! We have chosen to teach Arabic because of its connection with our faith, and French because my husband’s Mauritian heritage. Others may suggest Spanish, Mandarin, or even Latin. I would advise that you look at your own family, where you live and what languages would be most useful for your children’s future. For one hour everyday, have your family speak ONLY in the new language. If they need something from you, they will have to ask for it a foreign language. Likewise, when you speak to them, speak to them in the new language. By doing this, you are putting the language in a real-life context that helps young children to learn. Charlotte Mason tells us that “…the child thinks in sentences” and so the most effective way to learn a new language is to have the words put into the context of sentence and place. 2. What’s in the Box? Fill a box with items you have in your home. Then pull one out at a time and ask your child (in the new language), “What’s in the box?” Pass the object to them and they should give you an answer in that language, in a full sentence if possible. Why not put cutlery or plastic animals in the box, or try different vehicles, fruit and veg or other household items. The possibilities are endless! When shopping with your children, read out the shopping list in a foreign language and ask them to retrieve the items for you. If your child is older, they could even write out the shopping list in the new language for you. This simple activity makes learning fun and interactive. Your children will not even realise that they’re having a language lesson! This game is one of my favourites! Make sure that your children have plenty of room to move about as you call out a command, such as “Run!” or “Jump!” in the foreign language. The children will then have to do that action until you call out the next one. Children have an incredible ability to retain songs, so use this innate ability to help them learn the new language! Sing nursery rhymes and children’s songs in that language. If you don’t know any yourself, look on Youtube! There are so many in different languages that you can listen to for free. Read you children’s favourite bedtime stories to them in a foreign language. This is an easy and enjoyable way to add exposure to the language with very little effort on your part. You will be amazed at the selection of bi-lingual books available at the library for you to take out. Once you children a comfortable understanding and using certain vocubulary in the context of their lives, you can begin to teach them how these words look in the written form and encourage them to write them themselves. For this stage in the process, we use Write-and-Wipe Flashcards from Word United. The Word United flashcards are available in English, Arabic, French, Spanish and German; teaching the alphabet, numbers, colours, shapes and actions in each of these languages. Each card shows the word or letter along with a beautiful high quality photo on one side; whilst the other side has that word written out, followed by a tracing and hand-writing exercise. These high quality cards are kept in a magnetically closing box, along with two wipe-able board pens. These beautiful flashcards introduce children to the foreign language in it’s written form, and allowing them to have hands-on practice spelling the words too. If you are interested in purchasing the Write-and-Wipe flashcards for your family, visit their website (www.wordunited.com), or visit the Word United Amazon Store . You also find them on Twitter and Instagram. Remember, very young children learn language through their ears, and not their eyes! Hold back on workbooks and textbooks until you children are starting to understand the spoken language. The ages 2 and 3 years-old are critical in language development, and thus this is the ideal time to begin introducing a new language to them. 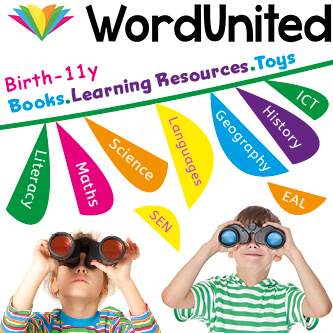 When your children are ready to move onto the written form of the language, try using bi-lingual books and flashcards, like the ones from Word United. This will your children with a solid foundation with which to master another language and help them in their further study of that foreign language. If you have any questions, please feel free to leave them in the comments below. I would also love to hear how you have successfully taught your children another language. In need of your duas. You have listed very useful advice here, thank you. I am also teaching my 5yo ARABIC and learning the meanings for myself. Its very strange, I think, that we get taught how to recite the Quran but aren’t taught the meaning. I want my child, InshAllah, to be able to read, understand and speak the Arabic language. Once again thank you for the amazing ideas! I am sure to write them down and use them in my homeschool. Thank you for your post, as always it is very instructive. We speak 2 languages at home and my son (2 year old) got a third one from his part time daycare. However none of them is Arabic, which we want him to learn for religious reasons. So I am thinking about using some of your ideas to introduce Arabic even if I don’t speak it myself, after all we can learn together. Does Charlotte Mason mention a limit regarding how many languages should be taught at once, in order to avoid confusion? Or is it the more the better?